Lifts West is the premiere luxury condominium resort in the Red River area, offering many of the amenities of a traditional hotel experience combined with the cozy privacy that comes with staying in a mountain condominium. Perhaps the best feature of Lifts West is the hotel’s proximity – to just about everything. In just a few minutes walk from their rooms, guests can find themselves hopping on a ski lift or strolling down Main Street for dining, live music, a festival, or a parade – or heading to the local grocery store, when it’s time to pick up a few essentials or stock your private kitchen. And when you’re ready for a day trip or other adventure exploring the surrounding area, New Mexico’s leading attractions are just a car ride away. As a Lifts West guest, you’ll also be drawn in to the hotel’s rugged charm. 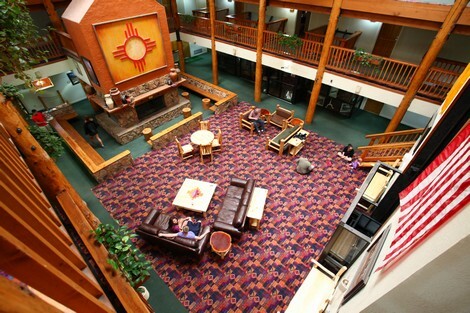 Whether it’s the no-two-alike room décor, the gorgeous atrium in the Main Building, the giant stone fireplace in the lobby, or the stunning views to be taken in as you go to and from the hotel, there’s just no replicating the visual beauty of a mountain vacation in Red River. If you’re planning a first visit, take a look at our gallery or room reservation sections to find out more about what’s in store for you. If you’re planning a return visit – welcome home!